If you live anywhere near Chicago you know that summer is finally here, and with a vengeance. I don't remember the last time I had my air conditioning on this early in the year. The farmers markets are filling up with bright and fresh produce and I am making room in the freezer for what summer pickings will provide. And that means the cranberries have to go, and what better way to use them up in this heat then with ice cream? 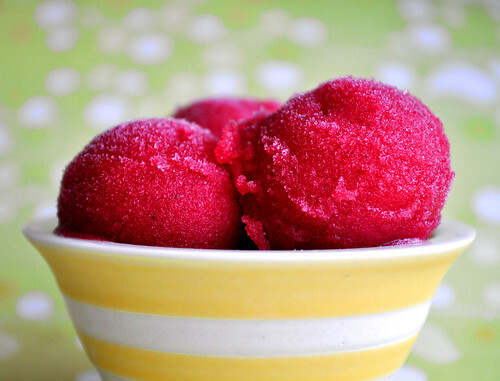 I tagged a recipe a while ago from Annies Eats and mixed in the last bottle of POM pomegranate juice I had left and maybe a bit too much Grand Marnier then was strictly called for and I had two pints of beautiful sorbet to cool down with. One more batch and I'll be ready for strawberry season in June. Cook cranberries, water, and sugar in a medium saucepan until liquid begins to boil. Let simmer for a few minutes until the cranberries have popped, then remove from heat and cover. Allow the mixture to cool, puree a food processor or a blender, and then pass through a fine mesh sieve to remove any large bits of cranberry skin. Stir in the juice and the liqueur. 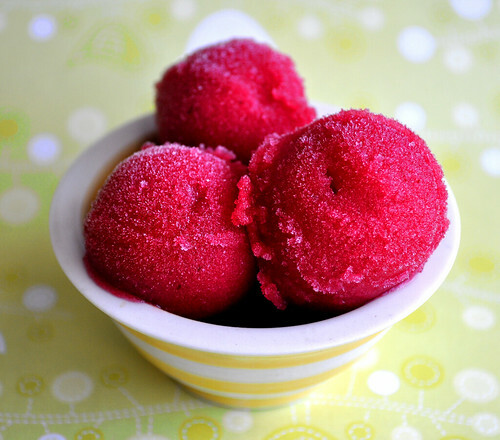 Chill the mixture thoroughly and then freeze in your ice cream maker according to the manufacturer’s instructions. 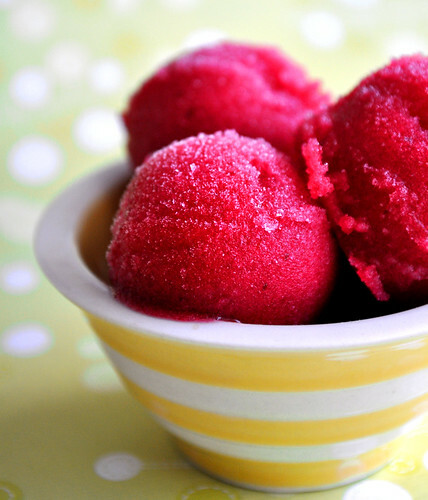 Scoop some out into a pretty bowl, find a nice air conditioned spot in the sun and enjoy. Wow! So vibrant color!! Love it! I added about a tablespoon of sour cherry concentrate. Spectacular!